Since turbocharged sports cars were becoming the fashion, Lotus launched its Esprit Turbo sports car in London's Royal Albert Hall, and hosted by its Formula 1 sponsor, Essex Petroleum. 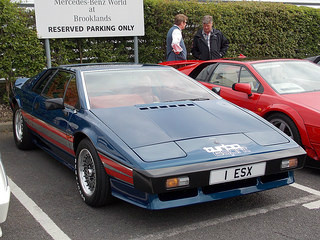 It was designated the Essex Commemorative Lotus Esprit Turbo, also known as the Type 82, and was only available in its sponsor's livery of blue, red, and silver. It was the introduction of this model that elevated the Esprit into the supercar league. Production began in February 1980, at an initial rate of ten units a week. It was powered by the 2174 cc, 16 valve, double overhead cam, Type 910 engine, similar to that used in the Sunbeam Lotus "hot hatch". With a compression ratio of 7.5:1, it was fitted with an AiResearch Garrett T3 turbocharger, providing a boost of up to 8psi, and two twin choke Dell'Orto DHLA4OH carburettors. With this arrangement, the 4-cylinder, aluminium engine developed 210 bhp at 6250 rpm, and 200 ft/lbs of torque at 4500 rpm, and produced a top speed of 152 mph, and a 0-60 mph time of 5.5 secs. It used the same five speed gearbox as the then current Esprit, and was fitted to the engine block using a new alloy bell housing. The backbone steel chassis had been redesigned, and was now zinc galvanized with, interestingly, a five year guarantee, based on normal use. The front suspension, based on that used in the Lotus Elite Mark 2, incorporated a widening of the track by one inch. The rear suspension was also revised. It used 10.5 inch front disc brakes, and 9.7 inch discs at the rear, together with a larger servo unit. The basic cockpit design by Guigiaro was unchanged from the Series 2 Esprit, although there were a number of minor alterations to the instrument panel. A stereo cassette unit was added, the seats were revised, and three piece 15 inch alloy wheels were fitted. The fact that the Esprit Turbo included a dry sump engine caused a number of adverse comments from the press. According to Lotus, the oil level needed to be checked no more than two minutes after switching off the engine. However, some press commentators found, after two minutes, huge variations in the oil level reading, and sometimes the very short dipstick showed no reading at all. The implication, therefore, was to play safe, and ensure that the tank was slightly overfull, which was contrary to what Lotus advised. Following such confusion, Lotus subsequently no longer incorporated the dry sump system. In total, 45 Essex Turbo Esprits were built, together with 59 dry sump Turbo cars, using the same specifications, but without the Essex livery. This model displayed a marked improvement in reliability compared with some previous Esprit variants. Production of the Essex Turbo sports car ended in April 1981. Finally, in April 1981, the name Essex Turbo Esprit Type 82 was changed to Turbo Esprit Type 82, and this model offered a more traditional range of colours, whilst air conditioning and leather seats became optional extras. As a result, the selling price could be reduced, with a corresponding increase in sales. A total of 2,274 units of this latter model were built. 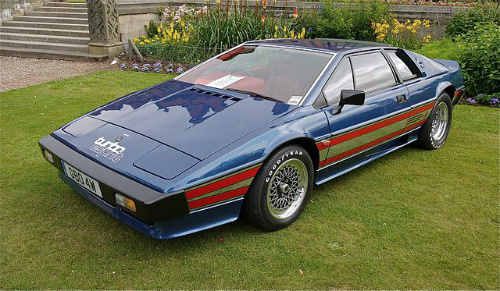 A 1980-81 Lotus Essex Turbo Esprit in good condition would fetch in the region of £14,000/$22,000.